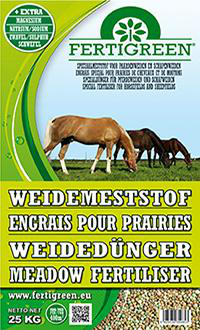 Thé complete NPK fertilizer for horse and sheep pastures. 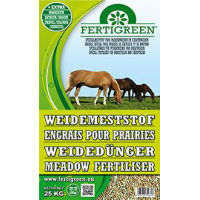 Fertigreen® fertilizer for pastures is a unique NPK fertilizer uses Entec® environmentally friendly fertilization technique. The nitrogen is environmentally aware and released according to requirement of the grass. The gradual nitrogen availability ensures that the grass will not grow over and protein content remains low in the grass. Better utilization of Entec® nitrogen can save on nitrogen fertilization. Balanced NPK ratio with easily absorbable phosphorus and potassium. The existing magnesium is needed as a building block of chlorophyll in the plant. Additional content of sulfur in the production of high-quality protein. Contains a significant amount of sodium. This contributes to the health of the animal and makes the grass and hay extra tasty.